Business models for more sustainable and competitive creative enterprises? As part of a creative momentum project, NUI Galway has developed a Creative Business Model Toolkit. In this article we explore what the toolkit covers and why business models are important in the creative sector context. In recent years, the term ‘business model’ is increasingly used. But it is more than a catchphrase. Even though we might be in the midst of the era of the business model, evidence suggests that companies who refine and develop their business model can improve their sustainability and performance. For example, surveys conducted as part of the Brighton Fuse project, which supported Brighton’s creative, digital and IT cluster, found that higher growth companies were more likely to have made adaptations to their business model. Brighton Fuse also found that having a more differentiated model, made up of a number of revenue streams, correlates to greater levels of innovation. We hope our toolkit will help creative enterprises understand the relevance of business models to their own individual needs and contexts. Business models are more than how a business generates revenue or its organisational structure. They have a number of dimensions that interact, which key thinkers in the area have explored. In Alexander Osterwalder and Yves Pigneur’s handbook ‘Business Model Generation’ they organise key characteristics into a structure that enables businesses to translate the business model concept into practice. In our toolkit, we draw on the Business Model Generation approach to business models that breaks them down into nine building blocks. In the ‘Understanding’ section of our toolkit we discuss what each building block means, as well as distinctive issues and cases relevant to the creative sector. Building blocks also influence each other and are interlinked. For example, one building block is revenue streams, but effectively tapping into these links to other building blocks, such as customer relationships and channels. It goes without saying that creativity is core to creative business. Combining creativity and business can be challenging, but working on your business model may help to keep them in balance. 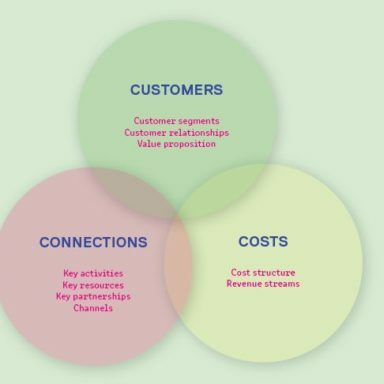 Business models are concerned with both how a business creates value (its value proposition) and captures financial revenue from the value it creates. 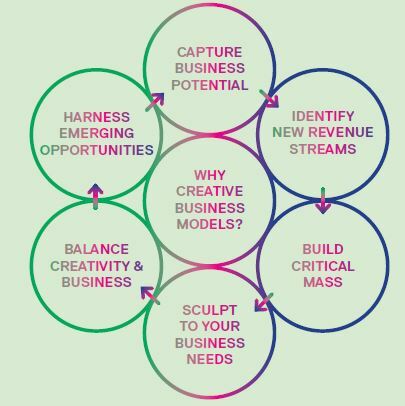 In our toolkit, we further examine a number of reasons why creative enterprises should focus on their business model. The toolkit also includes a number of tools for analysing and planning creative business models. In the ‘Shaping’ section we have developed glossaries focused on de-mystifying the vast array of terms used to describe revenue streams. 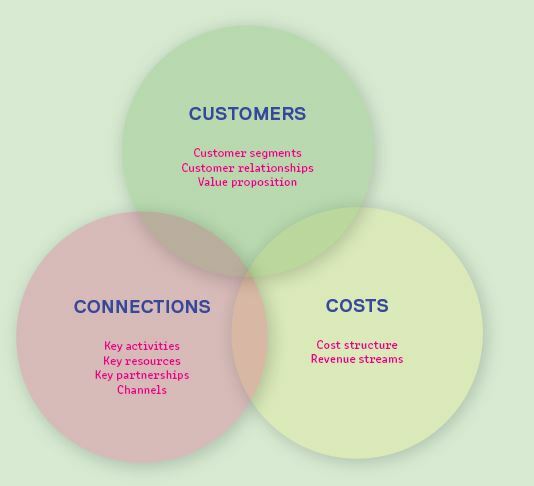 This part also provides a framework to analyse your own business model. A toolkit for all creative entrepreneurs? 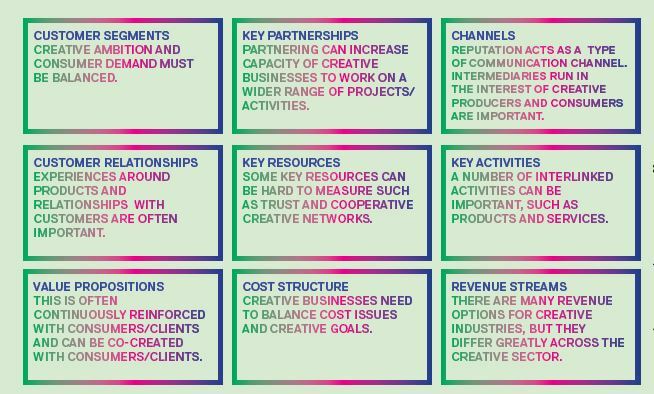 We hope all creative entrepreneurs will find aspects of the Creative Business Model Toolkit useful. It should be particularly helpful to emerging creative talent thinking of setting up a business, as well as early stage creative entrepreneurs. We also hope more established creative entrepreneurs without a background in business or management will find the information it contains useful. Developing a business model is not just a one-off exercise and is best reassessed at different stages of business development. We also hope you’ll come back to this toolkit at different times and use particular sections of interest to your needs. We’re working on a series of short articles on our Creative Business Model Toolkit. Next week we’ll look at the creative business cases discussed in the toolkit.